"Frame your name in Trendy Alphabet Art! The perfect gift for that special occasion!" Please see below some Trendy Alphabet Art examples or gift ideas. Please note that all samples on our website and on display at our shows have an 'Off White/Tint' mount unless stated. Know someone with a Special Occasion in the near future? A ‘FIRST NAME’ framed makes a wonderful Birthday, Christening or Bar/Bat Mitzvah Gift or it will even make a great Christmas present. A ‘SURNAME’ is a great idea, either as a Wedding Gift for the newlyweds or just for yourself! A lovely personalised gift with your choice of photos would be a great addition in any hallway or dining room – A great talking point!! The perfect Housewarming Gift! Have you moved house recently or know someone who has? A Trendy Alphabet Art ‘HOME’ or ‘FAMILY’ frame is the perfect unique housewarming gift to make a house feel like a home! Are you looking for something different to give a loved one as a Gift? Why not show that someone special that you love them with this lovely personalised gift. Or, these frames are perfect as a Wedding or Anniversary Gift. We have made many ‘names in frames’ for people we have met at craft shows who have lost a relative or friend. We, like them, think that this is the perfect way to remember a lost loved one. The letters can also be selected so that they relate to their interests or remind you of them. 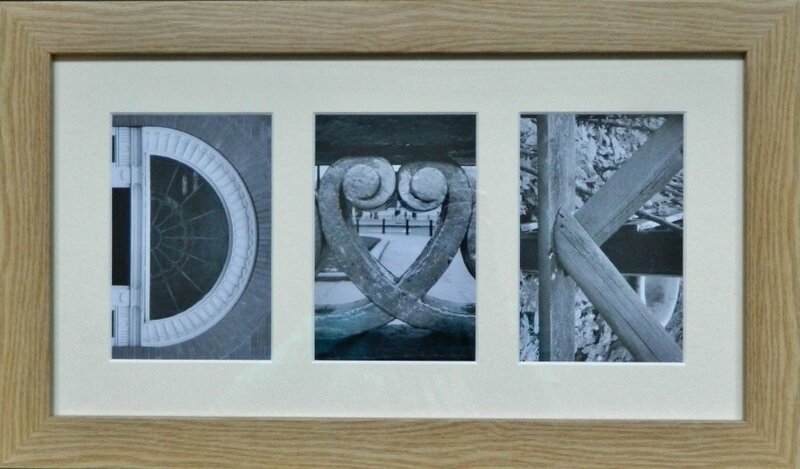 Our 'Initial Heart Initial' frame would make a lovely personalised gift for a wedding, anniversary or an engagement. It is also a great present to buy a couple for Christmas. Why not treat yourself to a Trendy Alphabet Art frame! You could purchase your own Name or Surname, Home or Love or maybe one of the suggestions below. Visit our home page to have fun creating a name or word of your choice.